Appreciated as one of the few of the old palaces left untouched by communist razing, the garden is a popular place for cultural events and fairs. The crowd is also drawn by the many cafes and terrace bars surrounding the area. It's not a very large though, so even a moderate crowd gives the impression of bustling activity. There are two playgrounds for children, and a special play area for dogs. The atmosphere is cozy and intimate. The area used to be called the 'Little Paris of the East'. How popular is Gradina Icoanei? People normally club together Biserica Coltea and Bulevardul Unirii while planning their visit to Gradina Icoanei. A very beautiful park right in the middle of Bucharest: lots of benches, playgrounds and all kind of amazing toys and installations for kids, nice alleys, great atmosphere, amazing trees - an oasis! Refreshing and suitable place at any age, just minutes away from the very central noisy boulevards! 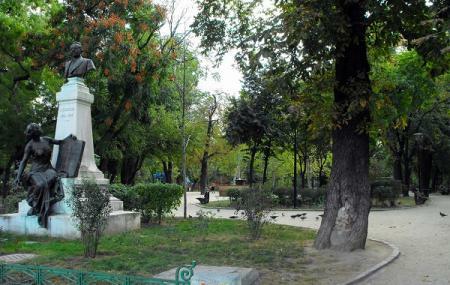 Though it worths better care from municipality side, concerning the pathways and the park furniture mainly. Quite lovely. Very beautiful. Tranquille.